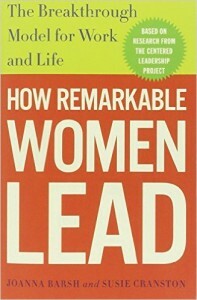 This insightful and helpful book is another necessary book for the library of a woman in leadership in any capacity. Using their well-researched and effective Centered Leadership model, Barsh and Cranston walk readers through functional and clearly communicated steps to maximize their work and personal hours. This is not a typical “how to have it all” type of book. In fact, they point out several times that no one can have it all and that there is no such thing as work/life balance. All there is is yourself and your center and maintaining as close to your center as you can. They advocate for self-evaluation as the starting point for career success – what do you want to do? What gives you energy? What drains energy? How do you combat anxiety and fear? Are you someone who needs medication in order to do that? Physical activity is necessary for centering – are you someone who needs a lot or a little to achieve that. Every point the authors make is demonstrated through anecdotes from women with strong leadership experience in a variety of disciplines. I would have liked a few less CEOs and a few more social service or religious leaders, because their leadership challenges would not only add diversity to this book, but would be personally more in line with the challenges I face in my day job. Overall, I would absolutely recommend this book for anyone in leadership – not just women. It’s one to read through and refer back to and perhaps even teach from. If you are in any capacity to lead or mentor young women in particular, I would recommend giving this book a gander to be able to pass on some of its wisdom to them. Good strong coffee that encourages contemplation is the best accompaniment for this one. I was provided a copy of this book by my employer as part of my job. I reviewed it because I think it’s a fantastic resource as reviewing is not technically part of my job.